Little Lolly Cart - What is a Bomboniere? Here at the Little Lolly Cart, we’ve always grappled with how to describe ourselves; we normally end up with something like “It’s a lolly buffet but on a vintage cart” or “It’s a cart with candy on it”. Whenever we’ve gone to list ourselves on directories or registered with various exhibitions we haven’t really known which category box to tick, normally plumping for the ever-reliable ‘Other’ option! Then this weekend when we were describing what we do they say “Oh, so a bomboniere! ?”…queue slightly blank looks on our part. Maybe it’s our complete ignorance or just a really bad experience in Languages lessons back at school but we had to frantically take to Google to find out a bit more about our potential categorisation. We thought we’d very quickly dismissed the label of ‘bomboniere’ after reading the very first paragraph of a wikipedia entry that told us the word was an Italian derivation of the French ‘bonbonierre’ and referred to favour boxes containing sugared almonds (specifically five, representing Health, Wealth, Happiness, Fertility and Long Life…again, we’d always wondered what the deal was with almonds and weddings - every day is a school day!). 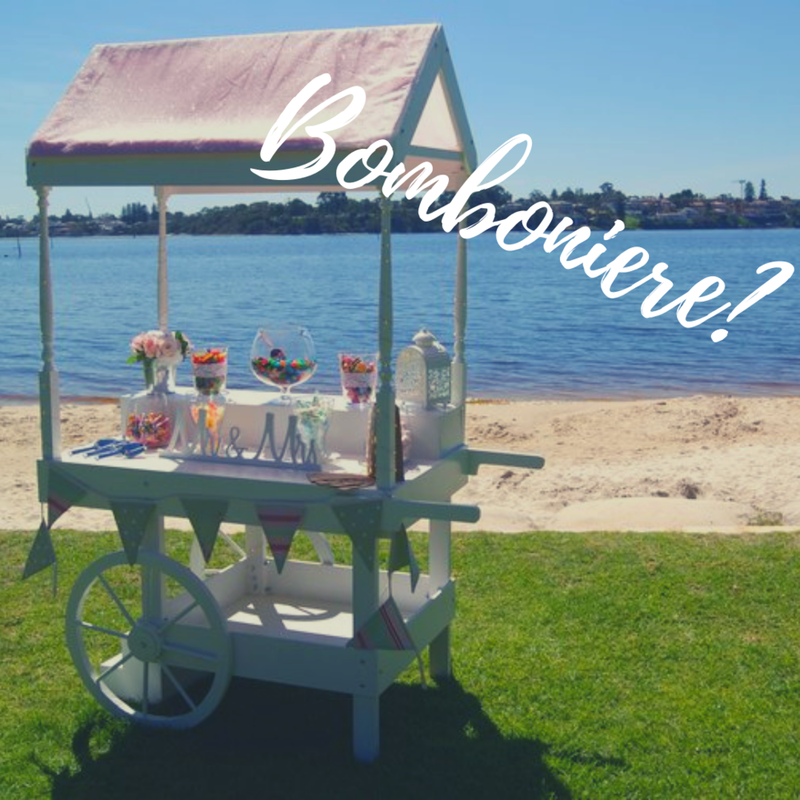 The word bomboniere in Australia applies to pretty much any gift or favour given at a life landmark ceremony, so not only weddings but also christenings and other similar events. Given this much broader definition it looked like Little Lolly Cart could be a bomboniere after all…but do lollies served up as a buffet really count as a bomboniere? We decided to stick close our home here in Perth and see what sort of bomboniere suppliers there are and take a look at the types of things they were offering and whether any of these were lollies. Several things are interesting to us in this quick 19 second video. The first is that all three business that Google has identified as bomboniere providers don’t have any website links in their Google Business listings…seriously people, you’re ranking right at the top of Google for your business and there isn’t even a website listed (contact me if you want to know how to sort that by the way - it take 3 minutes!). The second thing that is interesting is that the top hit, Easy Weddings, is a directory rather than a supplier. In fact, it’s not until you hit listing 4 that you find a “proper” supplier: Bella Basket & Bomboniere which is a Facebook page. Clearly not many companies in Perth are marketing themselves as specialist Bomboniere providers, which makes us wonder whether it is too niche a description. The third and maybe most worrying thing is that in the video you’ll see the Easy Weddings directory - despite specifically having searched “Bomboniere Perth” has the top result being from Victoria, with the second and third both being in NSW. But aside from sugared almonds and personalised candy in boxes, we really didn’t see any lolly buffets, candy carts or anything even vaguely similar. We definitely can see why someone might think of us as a bomboniere, but given we provide a service that is predominately designed to be used/consumed at the event itself rather than acting as a keepsake, it is probably a little wide of the mark. That said, the apparent lack of competition in terms of listings for “Bomboniere Perth” suggests throwing the description around might not do too much harm. It has however got us thinking about whether we can tailor our packages to serve a portion of our lollies pre-boxed/pre-packed so that people can take them away if they don’t feel like eating at the event and carrying a paper bag around with them. For now, we’ll be sticking with “It’s a lolly buffet but on a vintage cart”! but keep watching for what we do in this space and follow us on Instagram.